International aid and emergency response. Rotary New Zealand assists its partners in providing support to those living in poverty or affected by natural disasters. Our goal is to create sustainable outcomes - in the form of a hand up rather than a handout. Join us in our efforts to relieve suffering and poverty in developing countries. Rotary's motto, Service Above Self, is at the heart of everything we do. People can lose everything, including loved ones, when disaster strikes. You can help in a practical way. Help survivors get through the first days by providing Emergency Response Kits. Kits contain basic equipment so that a family can construct a simple shelter and clothe themselves. There are essentials such as tools, toiletries, first aid supplies and household items. Please help us reach our goal to have every child in the world vaccinated against polio and all countries certified polio-free. All children including those in challenging environments need the vaccine to protect them from this paralysing disease. Rotary and its partners have been working to eradicate polio for 30 years. Over this time, the number of polio endemic countries has declined from 125 to 3 in 217 - Nigeria, Pakistan and Afghanistan. It costs only US$3 to fully protect a child against polio. Every gift counts. Thank you. It’s all about teamwork. Without your generosity, partner projects in developing countries cannot be funded. But it takes more than money to really change lives. It takes compassion for those less fortunate than ourselves, expertise in many areas, stewardship, mentoring, capacity building and a can-do attitude – all of which we are able and keen to facilitate. Working with Civil Defence and other agencies in the Pacific, Rotary New Zealand provides rapid response when there are humanitarian crises such as the devastating floods in Fiji. Donations help us provide Emergency Response Kits and other basic needs. We also support and work with our partners in the recovery phase. 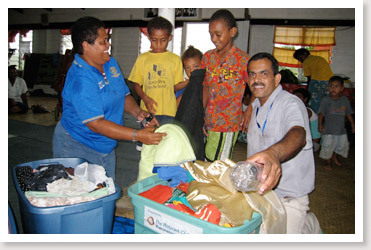 When disaster strikes in the Pacific, our Rotary Emergency Response Kits (ERKs) are in hot demand. When Cyclone Winston hit Fiji last season, we distributed over 1000 Kits to families who needed shelter, bedding, tools, medical supplies and other absolute essentials to survive. During the crisis, Rotarians and other donors began asking whether we had gift cards. They told us they wanted to be able to gift a Kit or some of its contents to a friend or loved one as a wedding, anniversary, birthday or memorial present. We responded immediately and can now offer gift cards to our donors. How does it work? Make your donation to our Emergency Response Kit cause on this page, then send us an email with the name and address of the recipient and amount you have donated. We will post a gift card to your friend or family member on your behalf. Your donation to Rotary New Zealand's projects greatly assists our work. Thank you. Every gift is appreciated and is tax-deductible in New Zealand. Your donation to Rotary New Zealand's projects greatly assists our work. Thank you. Your gift is appreciated and is tax-deductible in New Zealand. Please select a payment option that suits. Donate directly from this site. Alternatively, you could donate on Givealittle. Donate at any Westpac branch or via internet banking. Please put your name in the transaction reference field. Imagine losing your home, your livelihood, suffering injury or losing a loved one in a natural disaster. This is the reality for many people living in Pacific countries whose communities are often subjected to extreme weather events and natural disasters such as earthquakes and tsunami. Please help Rotary New Zealand respond immediately to disasters in the Pacific by donating to our Emergency Response Kit fund or one of the other causes on this page. For 33 years Rotary has on many occasions been the first to give families practical help in the form of Emergency Response Kits. Kits contain basic equipment so that a family can construct a simple shelter and clothe themselves. There are also essentials such as tools, toiletries, first aid supplies and household items. Teams of New Zealand Rotarians purchase items for the Kits, assemble them in New Zealand and send them to secure places in the Pacific where they can be accessed and distributed as quickly as possible following a disaster. None of this would be possible without great teamwork and the generosity of donors who trust that Rotary’s response will be well managed, fair to all and will respect the countries’ culture and environment. Gifting money through established organisations such as Rotary is the best way you can help. When disasters strike, people’s emotions can run high when they see graphic images and hear reports through the media of suffering and loss. With the best of intentions, they sometimes send clothing and other goods to the Pacific not realising that the items may not be needed or may attract duty demanded by governments that the recipient agencies cannot pay. Often such consignments end up in the landfill. Rotary partners with local NGOs and others to ensure that the money you give helps support families and often businesses that provide livelihoods for those affected by the disaster.